Yet in maintaining this site, I hear similar stories daily. Stories of lying and deception in an effort to get to the top of Mary Kay Inc. I don’t care what anyone says. These incidents are not isolated. I have heard literally thousands of similar stories. Women in MK compromise their morals to move to the next level, get a few extra recruits, or win a prize. Here is but one story of the shenanigans that go on at the director level. I am sorry to report that these types of things are all too common. Every time I catch my Director in a lie or I discover something disturbing about MK, I sort of feel a little sting. I am no longer a consultant, but I have not severed ties with my Director because, well, I actually work in her home as her office assistant. I have to hold on to this job until I finish nursing school, an endeavor which my Director/Boss calls “stupid”. That remark, of course, counted as a big jellyfish sting. I am saddened and embarrassed by my former ties to MK as a consultant and my continued association with it as one who dutifully yet grudgingly dispenses MK rhetoric far and wide as my boss’s unit and “future area” stretch from coast to coast. Now I must backtrack a bit…My very first sting was when I realized that by placing my $3600 inventory order in January (halfway through the MK year) some years ago, I had immediately landed in the top 10 in sales for our unit of nearly 300. I was up there amongst consultants who had been working at this for a long time and certainly had been working for the first half of that year, as well as another frontloaded newbie or two. I then realized that if these established consultants had not had cause to order much more product than what I had ordered in my initial inventory order, I really had no hope of turning my inventory in a year. My goal was to actually to turn it four times (my retail background now makes its debut on this blog), something which my Director said was guaranteed with her guidance. That was such a lie! Then, she totally shut down my business after just one week! She knew that I knew very few people in town and she recruited my only three personal contacts who were willing to hold classes and refer clients to me. She recruited them at a guest event when I went for my first training session. I thought it was the smart way to let them try product and for me to get some training. I knew nothing about cosmetics, so it made sense to me to go. I never had a chance to sell those three ladies or hold their classes, because they left that night as my competition. I was shut down. We all went to the same church, and they had all gone there for many years. I was a newcomer. And I was shut down out of business. That was my entire local circle. When I told her that I was very upset about how it had played out, she made me feel like I was incredibly short-sighted and had no head for business. Sting! She told me that the big money was in recruiting, and that anyone could be a customer but not everyone could be a team member. She told me that I was really missing the big picture. Sting! I then quit working my personal business, but I held on to my products because I was scared of getting fired if I returned them. I needed the job. And still do. Over the past few years as I have quietly worked to put together “awesome” and “exciting” newsletters, postcards, flyers, conference calls, training meetings, prize packages (sometimes costing her just $.50 for a prize) special guest events, emails, letters, retreats, challenges, banquets, picnics, slumber parties (yes, it’s true) charts, checklists, tracking sheets, and the website and more, I have caught my Director/Boss in many little lies and some big ones, and each time it leaves me feeling a bit stung, a bit sick. Just three months ago, one of her DIQ’s stepped down. This girl was a new consultant, submitted DIQ just two weeks after becoming a consultant and was then tracking to be a one month wonder. She had several working and recruiting personal team members and a huge handful of personal use consultants. She was blazing through the process so fast that she did not even have a true understanding of how it worked, and she unwittingly misled those close friends and family members who signed up as personal use consultants. I blame my Director for this. She was conducting many of those interviews herself and was using the lines “it’s just like buying a Sam’s Club membership” and “which line would you want to stand in? the full-price line? or the half-price line?” and those poor women thought that once they purchased the showcase/starter kit that they automatically had the discount on any orders for the entire year. The DIQ did not fully understand, but a 10 year veteran Director certainly did. STING. Last month, in a rush to reinstate some consultants who had passed their twelve-month mark in August, my boss had me send individual personal emails from her explaining that the company gives her so many free reinstatement packages per year and that she had personally selected them. This was a lie, of course. Consultants can be reinstated for about $20, and my boss was just going to personally pay for it and sign them up as her personal recruits. Then she would heap on the pressure to get them active once they were in again as her personals, I’m sure. Anyway, I sent this out to all 13 people who had not reinstated in their twelfth month, so I guess each one was specially selected. Sigh. And last year when my boss decided to make a big push to become a National, she had me send out invitations to a dinner party to her top consultants and their spouses. She asked me to tell them that she had given their names to Sales Development at MK Headquarters (big, fat lie), and that they were monitoring their individual and team activity as they had been marked as future directors. She told them that they would be receiving special promotions, prizes, and secret information well before the other consultants. That was a lie. Sting. I think I put myself at risk if I continue with any further examples. I guess I’ll leave it at that. I just wanted to share that even reputable directors who aren’t signing up illegals, falsifying social security numbers, robbing blind their grandmothers, drinking and shopping with Sean Key, selling to exporters, and sending their cousins into huge debt, and who have been around for a long time in reputable areas, still bend the truth and manipulate people and flat out lie to get things to happen. Her status was never at risk. Her Cadillac was never in jeopardy. She was not backed into a corner with any huge debt, needing a bigger commission check. I do her books, and she does not have maxed out credit cards or huge outstanding debt. She was running low on new consultants to frontload but still wanted her totals to look good. She was just overly ambitious and hungry for company recognition. She was also ready to move beyond worrying about the next DIQ and the next new consultant and the next skin care class. She wants to go National and just sit atop her plush, pink, pyramid and wave to the adoring peasants at her feet. 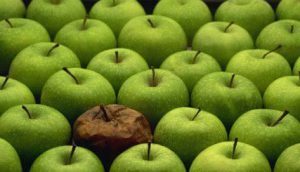 “there’s always one bad apple in the bunch” is not the way that saying goes. it’s “one bad apple SPOILS the whole bunch (or barrel).” Mary Kay misquoting things again to shivt the blame. Because rot spreads from one apple to the apples next to it, and soon the whole barrel is full of rottenness. If you put a rotten apple in with a bunch of good ones the rottenness will spread to the other apples relatively quickly. However, if you put a good apple in with a bunch of rotten ones, it won’t make the rotten ones any better. That was interesting reading. But for my own interests, I focused on the fact that three women were recruited from church contacts. MLM and organized religion are paired. And it is disturbing. I disagree. MK/MLM and independent accountable-to-no-one-but-Jesus churches are paired. But I have never found MK or any other MLM able to gain a strong foothold in traditional mainstream denominations that are accountable to a central authority, like a council of bishops. Other than baptists, that is. But if you read the Baptists Faith and Message, they consider themselves independent churches accountable ultimately to their local membership. If she’s a pastor’s wife she’s not Catholic. Also, she may claim to be Catholic or Lutheran, but she can’t influence a mainstream denomination the way an NSD in an independent church can. The reason is that she can’t attain the same height of church leadership at a tightly organized mainstream denomination. She has much greater access to church leadership at any loosely organized independent church. I also note that you’re speaking as one who denounces “organized religion” so I have to wonder how long you’ve been away from traditional denominations. But God bless you. We’re united in our desire to purge women of the MLM plague. It bothers me when church and business, are paired. My friend’s daughter in law does MK, her husband is the minister of a Christian church, and I feel like she uses his/her church position to market MK. And don’t get me started on the LDS church and proliferation of MLM schemes. I felt like attending a church meeting was really an MK event, with large basket of MK prominently on display and cards to sign up, offered by the Bishop’s wife. When I mentioned that it was a conflict of interest, I was told to MYOB. We’ve had this discussion before about your unhappy experience in LDS churches, and I agreed with you about them. I’ll just conclude here by saying that your LDS experience doesn’t translate into most traditional mainstream Christian churches who are accountable to a council of bishops or senior leadership. @MLMRadar – “I also note that you’re speaking as one who denounces “organized religion” so I have to wonder how long you’ve been away from traditional denominations.” … I think that assumption was a bit of a leap. I’m in church every Sunday, and have family in both denominations. (And BTW-It wasn’t necessary to point out there are no clergy wives in the Catholic church.) And yet I personally know 2 NSDs – one Catholic and one Lutheran (pastor’s wife). I appreciate your strong defense of traditional Christianity. I feel the same way, too. I just have seen too much MLM, even in traditional churches in my neck of the woods. Thinking that somehow a council of bishops or senior leadership will prevent the spread of MLM in church is flawed. If they don’t know the dangers of MLM it can appear harmless, or even good, so oversight from a council or senior leadership won’t stop MLM in any church if they haven’t established any kind of ban on it. Ignorance of the truth, whether it’s the dangers of MLM or the tenets of faith, cause confusion and stereotypes. We should be above that. I appreciate your vigorous defense of Christianity. Like me, you want to defend what you believe and correct misconceptions. But we never want to assume our valued institution is blameless, lest we sound like the kaybots defending MK. That is why we are all united in spreading the truth about MLM, and educating everyone that God has never endorsed any MLM ever! I was responding on my cell phone (small screen) and thought you were someone else. Sorry you got caught in the middle. I’ve been a church-going Catholic most of my life, but did explore various mainstream traditional Protestant denominations for a while, and I have family who are solid church-going members of mainstream Protestant churches. Also, because of my job I moved every few years for a few decades, so I’ve been a member of more congregations than most people ever see. Not once in all that time did I find the traditional churches infested with MLM recruiting. Not that the MLM-ers didn’t try. But at the churches I attended they got shut down pretty fast. We didn’t allow our congregations to become secular business networking places, so the MLM-ers were never able to gain a strong foothold. Friends of mine who went the independent non-denominational route, the churches accountable to no one but their own members, had a different experience. Add in a generous input from the likes of Joel Olsteen and Joyce Meyer prosperity gospel, and the MLMs had a fertile recruiting ground. It was frustrating, and worse. So that’s my background. I understand you had a different experience. Thank you for your goodwill. Wherever the MLMs try to find a way to infiltrate, we have to be there to call out the fraud for being a fraud. A lot of it depends on where the church is, how cohesive the congregation is, and the social status of the clergy’s wife or the (whatever they call Catholic women’s groups) leaders … a small town church with a cklergy’s wife or dynamic Ladies Auxiliary leader who has solid family connections would be susceptible. And they will be TARGETED because of their networks. I have a problem of ANY MLM using and abusing the social networks of their workplace, their child’s school and sports, book club, or whatever. When I worked as a consultant, I wouldn’t say anything about my business at church unless someone approached me about it. It’s the same reason why I never talked to co-workers about buying product or hosting parties. I didn’t feel church and the workplace were the spots to promote my business. Once I got to work, I was ‘single track minded’ to do my job. I wasn’t going to stress over Mary Kay or warm chatting one of my co-workers. Excellent. When I taught school, a co-worker routinely cornered us to buy MK. And then, it became like a high school clique, “So and So is having an MK party, I am going” and you felt left out because you were not invited. Of course not, because I didn’t have the money to waste on MK. If everyone had this ability for critical-thinking, MLM’s would be extinct. Critical thinking saved me from losing more money than I did. I wasn’t willing to order a bunch of product until I had a chance to see what people would want. I also didn’t have much extra money and wasn’t willing to go into debt. I was recruited at church. After I quit Mary Kay, I went to nursing school. During a research paper class, I decided to write a paper about recovery from cult membership based on some of the things I read on this site and a book written by a man in Amway. It wasn’t until doing the research for the paper that I realized how much of a cult the church was. I became doubly free as a result of the work being done to maintain this site. Thank you!